As important regulators of gene expression long noncoding RNAs (lncRNAs) are implicated in various physiological and pathological processes, including cancer. An oncogenic role of MNX1 antisense RNA 1 (MNX1-AS1) lncRNA has been suggested in cervical cancer and glioblastoma. In this study, we investigated the clinicopathological significance and biological function of MNX1-AS1 in gastric cancer (GC). The expression of MNX1-AS1 was analyzed by qRT-PCR in 96 GC and adjacent non-tumor tissues in relation to clinicopathological features and overall survival (OS) of patients, and in five human GC cell lines compared to a normal gastric epithelial cell line. 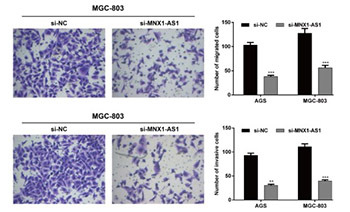 Loss-of-function experiments using small interfering RNA (siRNA) targeting MNX1-AS1 (si-MNX1-AS1) were carried out in AGS and MGC-803 GC cell lines. Cell proliferation (CCK-8 assay), migration (Transwell) and invasion (Transwell Matrigel), and protein expression of proliferating cell nuclear antigen (PCNA), E-cadherin, N-cadherin, vimentin and matrix metallopeptidase 9 (MMP-9) were analyzed in transfected GC cells. Expression of MNX1-AS1 was significantly higher in GC vs. adjacent non-tumor tissues. Higher MNX1-AS1 expression was significantly associated with tumor size, TNM stage and lymph node metastasis. Kaplan–Meier analysis showed that GC patients with higher MNX1-AS1 expression had worse OS compared to patients with lower MNX1-AS1 expression. Multivariate analysis showed that MNX1-AS1 is an independent poor prognostic factor in GC. Knockdown of MNX1-AS1 significantly inhibited proliferation, migration and invasion of AGS and MGC-803 cells, and resulted in increased E-cadherin and decreased PCNA, N-cadherin, vimentin and MMP-9 expression. Taken together, these results suggest that MNX1-AS1 has an oncogenic function in GC and potential as a molecular target in GC therapy. Patru CL, Surlin V, Georgescu I, Patru E. Current issues in gastric cancer epidemiology. Rev Med Chir Soc Med Nat Iasi. 2013;117(1):199-204. Cancer Genome Atlas Research N. Comprehensive molecular characterization of gastric adenocarcinoma. Nature. 2014;513(7517):202-9. Kulasekararaj AG, Kosmider O, Mufti GJ. Diagnosis and Prognosis: Molecular. In: Platzbecker U, Fenaux P, editors. Myelodysplastic Syndromes : Diagnosis - Prognosis - Therapy. Cham: Springer International Publishing; 2018. p. 15-37. Fatica A, Bozzoni I. Long non-coding RNAs: new players in cell differentiation and development. Nat Rev Genet. 2014;15(1):7-21. Esteller M. Non-coding RNAs in human disease. Nat Rev Genet. 2011;12(12):861-74. Ferreira HJ, Esteller M. Non-coding RNAs, epigenetics, and cancer: tying it all together. Cancer metastasis reviews. 2018;37(1):55-73. Schmitt AM, Chang HY. Long Noncoding RNAs in Cancer Pathways. Cancer Cell. 2016;29(4):452-63. Zhang Q, Li X, Li X, Li X, Chen Z. LncRNA H19 promotes epithelial-mesenchymal transition (EMT) by targeting miR-484 in human lung cancer cells. J Cell Biochem. 2018;119(6):4447-57. Huang C, Yu W, Wang Q, Cui H, Wang Y, Zhang L, et al. Increased expression of the lncRNA PVT1 is associated with poor prognosis in pancreatic cancer patients. Minerva Med. 2015;106(3):143-9. Yue B, Qiu S, Zhao S, Liu C, Zhang D, Yu F, et al. LncRNA-ATB mediated E-cadherin repression promotes the progression of colon cancer and predicts poor prognosis. J Gastroenterol Hepatol. 2016;31(3):595-603. Sun M, Nie F, Wang Y, Zhang Z, Hou J, He D, et al. LncRNA HOXA11-AS Promotes Proliferation and Invasion of Gastric Cancer by Scaffolding the Chromatin Modification Factors PRC2, LSD1, and DNMT1. Cancer Res. 2016;76(21):6299-310. Peng W, Si S, Zhang Q, Li C, Zhao F, Wang F, et al. Long non-coding RNA MEG3 functions as a competing endogenous RNA to regulate gastric cancer progression. J Exp Clin Cancer Res. 2015;34:79. Pan W, Liu L, Wei J, Ge Y, Zhang J, Chen H, et al. A functional lncRNA HOTAIR genetic variant contributes to gastric cancer susceptibility. Mol Carcinog. 2016;55(1):90-6. Sun M, Jin FY, Xia R, Kong R, Li JH, Xu TP, et al. Decreased expression of long noncoding RNA GAS5 indicates a poor prognosis and promotes cell proliferation in gastric cancer. BMC Cancer. 2014;14:319. Li AH, Zhang HH. Overexpression of lncRNA MNX1-AS1 is associated with poor clinical outcome in epithelial ovarian cancer. Eur Rev Med Pharmacol Sci. 2017;21(24):5618-23. Lv Y, Li H, Li F, Liu P, Zhao X. Long Noncoding RNA MNX1-AS1 Knockdown Inhibits Cell Proliferation and Migration in Ovarian Cancer. Cancer Biother Radiopharm. 2017;32(3):91-9. Gao Y, Xu Y, Wang J, Yang X, Wen L, Feng J. LncRNA MNX1-AS1 promotes glioblastoma progression through inhibition of miR-4443. Oncol Res. 2018. Liu Y, Zeng X, He Z, Zou Q. Inferring microRNA-disease associations by random walk on a heterogeneous network with multiple data sources. IEEE/ACM Trans Comput Biol Bioinform. 2016. Smith MT, Guyton KZ, Gibbons CF, Fritz JM, Portier CJ, Rusyn I, et al. Key Characteristics of Carcinogens as a Basis for Organizing Data on Mechanisms of Carcinogenesis. Environ Health Perspect. 2016;124(6):713-21. Wang Y, Chen T, Huang H, Jiang Y, Yang L, Lin Z, et al. miR-363-3p inhibits tumor growth by targeting PCNA in lung adenocarcinoma. Oncotarget. 2017;8(12):20133-44. Strzalka W, Ziemienowicz A. Proliferating cell nuclear antigen (PCNA): a key factor in DNA replication and cell cycle regulation. Ann Bot. 2011;107(7):1127-40. Guzinska-Ustymowicz K, Pryczynicz A, Kemona A, Czyzewska J. Correlation between proliferation markers: PCNA, Ki-67, MCM-2 and antiapoptotic protein Bcl-2 in colorectal cancer. Anticancer Res. 2009;29(8):3049-52. Qiao L, Shiff SJ, Rigas B. Sulindac sulfide inhibits the proliferation of colon cancer cells: diminished expression of the proliferation markers PCNA and Ki-67. Cancer Lett. 1997;115(2):229-34. Ben-Izhak O, Bar-Chana M, Sussman L, Dobiner V, Sandbank J, Cagnano M, et al. Ki67 antigen and PCNA proliferation markers predict survival in anorectal malignant melanoma. Histopathology. 2002;41(6):519-25. Lee KE, Lee HJ, Kim YH, Yu HJ, Yang HK, Kim WH, et al. Prognostic significance of p53, nm23, PCNA and c-erbB-2 in gastric cancer. Jpn J Clin Oncol. 2003;33(4):173-9. Mestrinho LA, Faisca P, Peleteiro MC, Niza MM. PCNA and grade in 13 canine oral squamous cell carcinomas: association with prognosis. Vet Comp Oncol. 2017;15(1):18-24. Lv Q, Zhang J, Yi Y, Huang Y, Wang Y, Wang Y, et al. Proliferating Cell Nuclear Antigen Has an Association with Prognosis and Risks Factors of Cancer Patients: a Systematic Review. Mol Neurobiol. 2016;53(9):6209-17. Kalluri R, Weinberg RA. The basics of epithelial-mesenchymal transition. J Clin Invest. 2009;119(6):1420-8. Zheng X, Carstens JL, Kim J, Scheible M, Kaye J, Sugimoto H, et al. Epithelial-to-mesenchymal transition is dispensable for metastasis but induces chemoresistance in pancreatic cancer. Nature. 2015;527(7579):525-30. Di Bartolomeo M, Pietrantonio F, Pellegrinelli A, Martinetti A, Mariani L, Daidone MG, et al. Osteopontin, E-cadherin, and beta-catenin expression as prognostic biomarkers in patients with radically resected gastric cancer. Gastric Cancer. 2016;19(2):412-20. Jun KH, Lee JE, Kim SH, Jung JH, Choi HJ, Kim YI, et al. Clinicopathological significance of N-cadherin and VEGF in advanced gastric cancer brain metastasis and the effects of metformin in preclinical models. Oncol Rep. 2015;34(4):2047-53. Otsuki S, Inokuchi M, Enjoji M, Ishikawa T, Takagi Y, Kato K, et al. Vimentin expression is associated with decreased survival in gastric cancer. Oncology reports. 2011;25(5):1235-42. Yilmaz M, Christofori G. EMT, the cytoskeleton, and cancer cell invasion. Cancer Metastasis Rev. 2009;28(1-2):15-33. Richardson AM, Havel LS, Koyen AE, Konen JM, Shupe J, Wiles WGt, et al. Vimentin Is Required for Lung Adenocarcinoma Metastasis via Heterotypic Tumor Cell-Cancer-Associated Fibroblast Interactions during Collective Invasion. Clin Cancer Res. 2018;24(2):420-32. Li R, Hebert JD, Lee TA, Xing H, Boussommier-Calleja A, Hynes RO, et al. Macrophage-Secreted TNFalpha and TGFbeta1 Influence Migration Speed and Persistence of Cancer Cells in 3D Tissue Culture via Independent Pathways. Cancer Res. 2017;77(2):279-90.